Dude…. That is Some Serious Box! 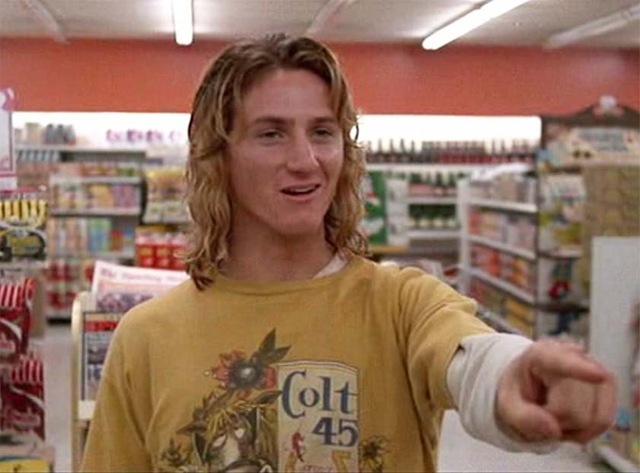 Said Jeff Spicoli to his surfer bro prior to rescuing Brooke Shields from drowning…. Ok… maybe he never said that but he probably would have had he taken a look at how many fly boxes most of our fly fishing brethren carry for a day on the water! So today is all about the box. How many do you carry? What is in yours? How do you organize them? What kind works best for you? When is the last time you used said gear, fly, tippet, etc….? Is there something else that you are carrying that can get the job done in similar fashion? As most of you could imagine, it was amazing how much gear now sits in the gear box in my car rather than stuffing my bag, vest, waders, etc…. Now let me make a small disclaimer. If you are in a boat with a good sized boat bag this is a much less compelling discussion. If you are a wading fly fisher primarily this may be a revelation that is nothing short of life changing. Almost as mind blowing as realizing that Justin Bieber is really just a Monsanto project that used modified DNA from Vanilla Ice and Clay Aiken. If I am only on the water for a few hours or on a river I know well and know what I will be fishing for, I will most often be seen in my waders, a lanyard and one medium or two small fly boxes in my wader pocket along with two spools of tippet. A good lanyard will hold the basic necessities. 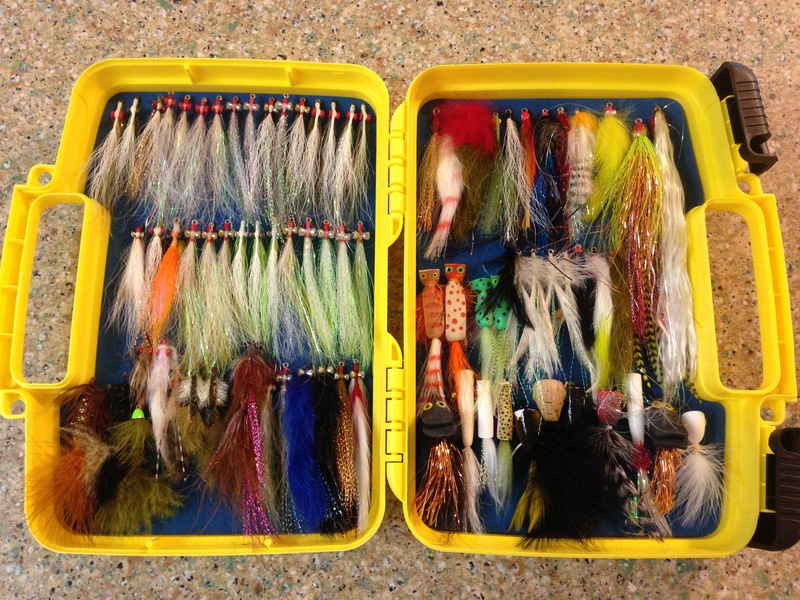 All of the above flies can fit in one medium sized box for a day on the water! One of the most valuable fly fishing lessons I have ever learned is that the 80/20 rule of life applies to fly fishing as well. 20% of your success may very well rest in having the right fly. The other 80% is vested in your ability to read water, approach the fish without alerting it to your presence, and lastly to make a presentation with your fly that looks natural enough to resemble something edible. The above is my “meat box” that I travel with. Prior to hitting the water, I will pull from this box and fill 1 or 2 fly boxes for what is appropriate for the water and conditions I am about to fish. As fly fishers we all love gear and I am no different. Just remember most of it is designed to catch you rather than catch fish. A very successful Erie steelhead fly fisher I know jokes that he carries two fly boxes. One is for the two or three flies he uses with regularity and the other is the decoy box he shows whoever walks up and asks what he was using to catch all of those fish! So once we have pared down our flies to a reasonable selection, how do we go about organizing what we carry? Remember, you have a 0% chance of catching fish if your fly isn’t in the water so a successful fly fisher will look for ways to maximize that time. This again is a very personal thing but what works for me is to organize by water column. I start with surface flies and end with flies that work bottom. I know some people that organize by species but I never quite found that to be an intuitive way to think about what I was doing. I guess the key here is to have a system that works for you so when you need a specific fly that you know exactly where it is and can easily get to it. Now we have all fished a situation where we just didn’t have the right fly for the moment and I am not telling you to leave your best weapons at home. Go through the above exercise with your own fly boxes and I think you will be shocked how much lighter and stealthier you can fish. The last thing I would want to do is insult you, but Dude….. that is some serious box! Thankfully, I was not on a driving range but rather a beautiful Michigan river watching golf ball sized berries plunk the water at 9.8 as 10-15 lb river carp gobbled them up as they bobbed in the current. As luck and poor planning would have it, I did not have any mulberry flies so I made do with what I had. I found some pink over sized egg patterns and drowned the suckers in floatant and plunked them down hard! With only an hour to fish I was extremely luck that the good folks at Schultz Outfitters (www.schultzoutfitters.com) put me on some great spots in a hurry. I could see the storm clouds beginning to roll in and knew I was on the clock. The water was a bit high and moving quickly so getting a good drift was a challenge but after toying around with a few different angles a pair of yellow purple stained lips broke the surface and it was on. Hook set… came tight…. and off to the races. Before I could blink a good sized carp was in the fast current and the line was zipping off of my reel. She was heading straight for a huge brush pile and I knew I was in trouble. As I tried to chase her down I knew it was over. I put the wood to her and tried to turn her but between the girthy fish and the fast current the only thing I felt was my 3x popping as I grinned knowing that round 1 went to the fish. I tied on a new fly and plunked it down under the tree. Mend.. mend… mend… bang! 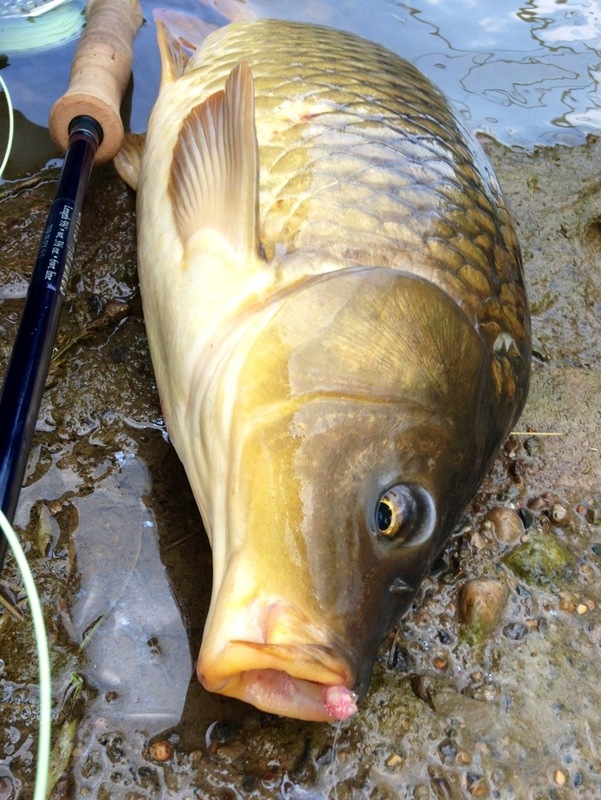 This time the fat fish bolted for open water and downstream. I chased her down and side pressured her into some slack water and I knew I had the advantage at that point. Five minutes later I was bank side with my prize. For a fish that I chase on the bottom 95% of the time, seeing them eat on the top for berries or cottonwood just lights me up. After releasing the fish, I could hear the the thunder heads getting closer and as I peered over the trees, things went black. I high tailed it to the car as a the lightning began and stripped my waders off as the hail stones bounced around me. Needless to say, I grinned the whole way home! Carping is no longer the other white meat. You don’t carp fish to prep for a bonefish trip…. you bonefish to prep for carping. If you are not ready for the coming carpocalypse you might want to go out and purchase a reel with a respectable drag, check your backing, put on a stripping guard, and go tell all the dudes you hang with at TU that you just followed Darth Vader to the dark side. Heading out to Vegas for the iCast show so if any of you are going to be in Vegas look me up! A friend is launching a very cool new product so for any of you who do any significant wading and chase big fish, this is for you! Carp, Chrome, etc….. I will be posting a full product review from Dale Fogg after his trip to the Colorado next week.